Posted on July 17, 2014 by Toni Carlstrom. 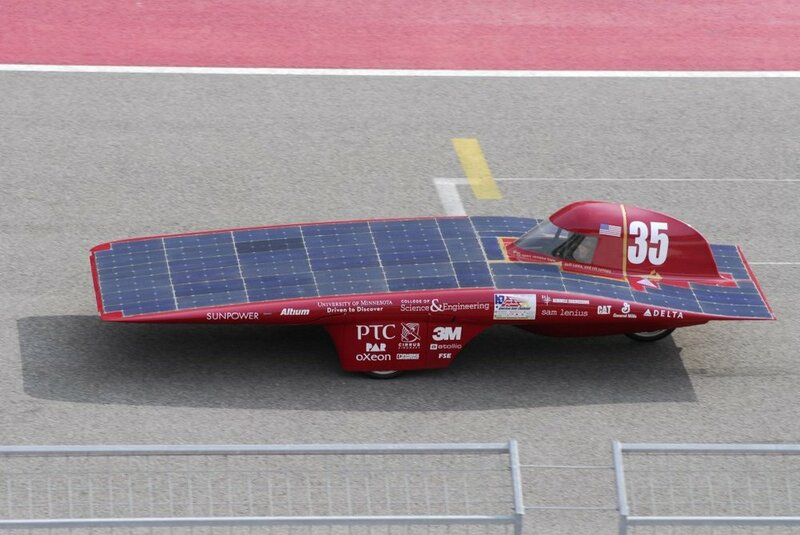 The Formula Sun Grand Prix is a track race for solar-powered vehicles that spans 3 days. Teams are required to complete 60 laps in one day or 90 laps in two days to qualify for the cross-country American Solar Challenge. 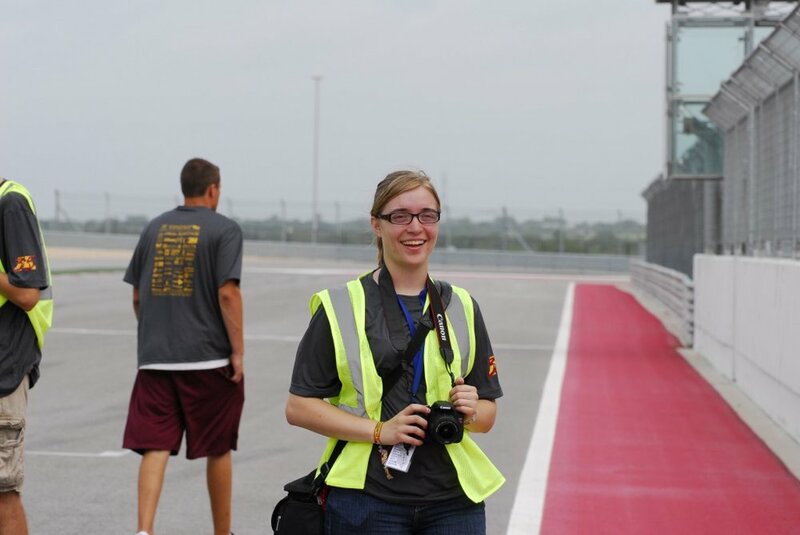 This year, the Formula Sun Grand Prix is on the Circuit of Americas Formula 1 track in Austin, Texas. We have successfully completed one day of racing, and started on our second day. Our team has four drivers, and each driver must complete 15 laps on the track to drive in the American Solar Challenge. After arriving in Texas, we have worked day and night to prepare the electrical system of the car. We have entirely replaced our electrical system, and are using this race to prepare the electronics for our next solar vehicle, which will race in the World Solar Challenge 2015. Our hard work has paid off, as the team started the race yesterday along with 9 other teams, and made it to the starting lineup again today. Yesterday involved additional electrical debugging and a tire change for mechanical team. The electrical problems were solved by replacing a fuse in the battery pack and securing mechanical connections. We were back on our way after making the fixes. We completed a total of 33 laps and qualified two drivers – Alex Nelson and Mason Trang. In addition, we tested out our new array stand and got some light charging in in the evening. The weather is not excellent for solar racing – but it could be worse. Our array is covered in a special coating from 3M which is excellent for capturing the diffuse sunlight produced during cloud cover. We had light sprinkles yesterday, with temperatures in the 80s. The sun peaked out occasionally. Today is very similar, with a light breeze coming through the pits. It hasn’t rained during the day, but last night it rained cats and dogs and most of our tents leaked. We hope things dry out a bit today, as we are continuing to camp at McKinney Falls State Park. A big thank you to our sponsor of the day, for the first day of the race, 3M! We would like to thank them for their continued support with raw supplies and solar array encapsulation. The top film on the encapsulation has small riblets which refract indirect light onto the solar cells. All of the cells on our car were connected by hand-soldered leads and carefully laminated between layers of EVA with a clear backing and the riblet film on top. The team does a shell lift with Centaurus III on the starting line while final electrical and mechanical tests are performed. Team Members Arlo Siemsen and Stephanie Wilson work on some electrical wiring for the solar array power trackers. Centaurus III speeds along the straightaway. Steph Wilson smiles as we leave Centaurus III in the starting lineup. Everyone was cheering when we watched Centaurus III go up the hill on the first turn of the track, for the first time. We barely made it into the starting lineup, completing the dynamic braking test early in the morning before the race began, and ensuring that the electrical system was good to go! Kee Onn, Nick Sloan, and the whole of Mechanical team are proud to have successfully changed two tires in under 10 minutes. Bryan, team lead and crew chief, is proud that we were able to complete the last 28 laps of the race without an electrical breakdown and that the only down-time we had after fixing our battery problems was for the tire change and a driver change. Arlo is pleased that the team managed to get almost 8 hours of sleep last night. And everyone is happy that we went out to eat as a reward for completing the first day of the race. Stay tuned for more updates! Also, check out our Facebook account under University of Minnesota Solar Vehicle Project and our twitter account, under UMNSVP.